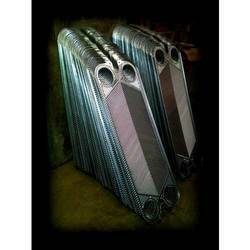 Plate Heat Exchanger (PHE) fall into three groups such as gasketed, fully welded and brazed. 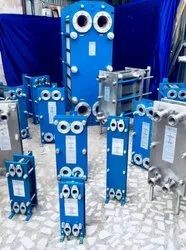 The basic plate heat exchanger consists of a series of thin, corrugated plates that are gasketed or welded together (or any combination of these) depending on the liquids passing through and on whether it is practical to be able to subsequently separate the plates, for whatever reason. The plates are then compressed together in a rigid frame to create an arrangement of parallel flow channels. One fluid travels in the odd numbered channels, the other in the even. Owing to our experience, we have been successful in catering to the requirements of our esteem clients by offering quality PHE Plates. The products offered by us are manufactured using high grade raw material. Our products are demanded in food & pharmaceutical industries for varied processes and also for heavy industrial applications in steel plants. 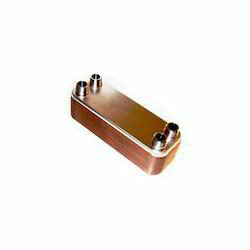 We have in stock for our customers a wide range of Brazed Plate Heat Exchangers. 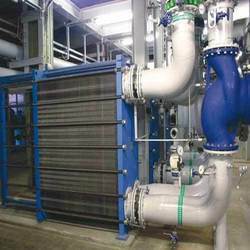 The offered heat exchangers consist of pressed stainless steel plates that are brazed with copper or nickel in a vacuum process. Our products are widely used in varied industrial applications such as cooling, heating and heat regeneration of liquids like milk, juice, water, cream and other chemical liquids. 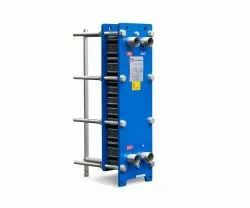 We are instrumental in offering a quality-tested range of Plate Heat Exchangers. The offered products are developed in adherence with the international quality standards and norms. Our exchangers are stringently tested by a team of quality auditors of our firm on varied parameters, before the final delivery. These products can be availed by the customers from us at market-leading prices. Moreover, our products are widely used by various industries for cooling and heating of liquids. Available with us is an excellent gamut of Gasketed Plate Heat Exchangers. All our products are developed by a team of skilled engineers as per industry set quality norms and guidelines. To meet the distinguish needs of the clients, we offer these products to the patrons in varied designs, sizes and technical specifications. Further, we charge reasonable rates for providing these products to the customers. 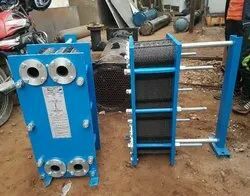 Gasketed Plate Heat Exchangers (PHE) with SS304 or SS316, .5 mm thick Plates and CS or SS Frame. 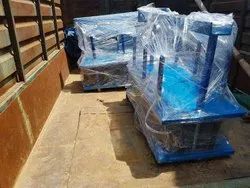 Used widely for Process Heating or Cooling due to its compact size, rigid design, easy maintenance and versatility in increasing the capacity. Spare Plates and Gaskets available in stock.